Many people are getting gray hairs since they were teens and as the years are passing by, more and more of those pesky streaks of grayish white will sneak in. Those of you who don’t want to get into harsh chemical dyes should find a natural way to cover up their grays. We recommend you to try to solve your issue by using sage. It has many health benefits and it’s known to soothe sore throats, treat depression, strengthen teeth and gums, ward off inflammation, and more. 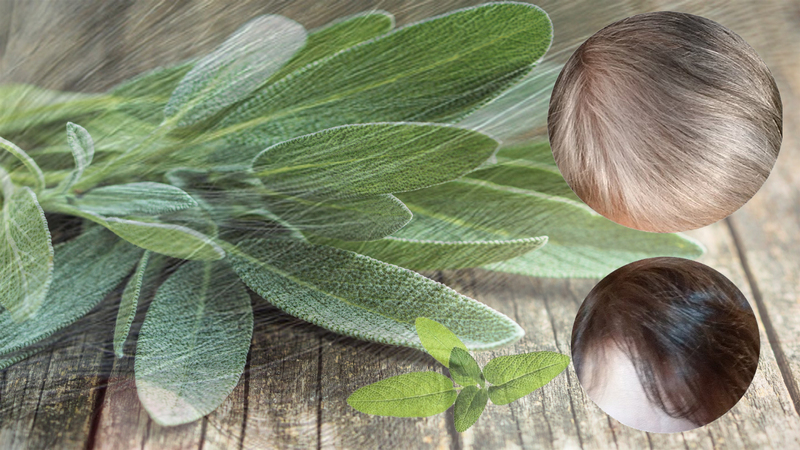 Sage is tasty on poultry and root vegetables and also is very good for your skin and hair. The good news is that sage is a natural hair tint for dark hair. If you start blending in sage with your natural hair color, over time your grey hairs will darken. You can add apple cider vinegar for the sage hair rinse because this vinegar can work wonders for your hair. Moreover, it is a great conditioner and detangler and will remove the residue build-up in your hair. If you use a fresh sage, start by removing it from the stems. In order to release their natural oils tear them a bit and then, pack the bowl full. Boil two cups of water, remove from heat and pour over herbs. You’ll need to steep the tea for at least 15 minutes and allow it to cool. This tea has a green color. If you suffer from a sore throat, make the same tea and add a bit of honey. After you strain the sage tea, you can add it to the vinegar. Using a cruet bottle will make it easier for you to apply the mixture to your hair. Use it as a final application after shampooing. Don’t worry about the smell because it will dissipate as your hair dries. Pour the rinse over your hair and let it drain. Do this several times in a row and then towel dry. If you want to succeed with this procedure you must use the sage rinse consistently several times a week. It will darken your grays over time and it will deepen the color of brown or black hair.